It's unusual to see a Citroen badge on what is obviously a sports utility vehicle (SUV), but it just proves how important Citroen believes the sector is that it must be part of it. Citroen may have joined the party later than most, but it has a presence nevertheless - something that shouldn't be dismissed - even if it didn't do all the work itself. Any keen car spotter will immediately see the glaring similarities between Citroen's C-Crosser and Mitsubishi's second generation Outlander. Essentially the cars are identical save for cosmetic nose and tail treatments and the badges. Why is this the case? Simply put, Citroen felt it needed an SUV and needed it quickly, hence the collaboration with Mitsubishi. Badge engineering, as it's often called, isn't always a bad thing. Granted, there's very little Citroen DNA in the C-Crosser apart from its admittedly attractive nose, but this is only likely to be an issue for the Citroen purists. For everyone else, the fact that you've got a choice of SUVs is a good thing. In essence, the C-Crosser is the SUV Citroen couldn't afford not to produce. Only it couldn't justify going it alone, hence the collaboration with Mitsubishi. The end result is a safe handling, refined, well-equipped and spacious soft roader. Only, being Mitsubishi based, it's well able to tackle more than just a muddy path. Switchable four-wheel drive and a decent ground clearance help matters, for sure. But the icing on the cake is the car's torquey and responsive diesel motor. You'll find this 2.2-litre unit in other Citroens, and in the C-Crosser it's the perfect partner. Factor in seven seats, high levels of equipment, a large dealer network and it all starts to make sense. Once a cynical quick fix, now badge engineering is being used by manufacturers to reach market sectors otherwise denied to them through lack of resources or technical ability. Citroen doesn't really possess any modern day SUV know how but Mitsubishi does, and has a product ideally suited for the 'soft-roader' set. The C-Crosser sacrifices much of Citroen's familiar design DNA on its way to SUV acceptance, but the end result is a competent, attractive and affordable product. If you're going to get an SUV, you better make it a diesel one. Although the fuel can be more expensive at the pump, you'll travel further per litre than with petrol. Luckily the C-Crosser is diesel only, which should mean sensible annual fuel and tax bills. Being well equipped - even without the sat-nav - the C-Crosser represents good value for money when up against more expensive SUV rivals. As an alternative to a people carrier or traditional family estate car, the C-Crosser boasts higher levels of practicality and space. 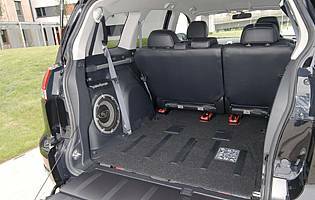 Oddment storage throughout the cabin is good, and the car's clever split tailgate allows you to slide items in and out - not over an high load lip. The C-Crosser's rearmost row of seats is also a feature worthy of note. They helpfully lie folded in the boot floor when not in use, and take only a moment to assemble. Useful for children, adults might struggle with access and the resultant modest amount of legroom. Predictably you're faced with Mitsubishi-sourced controls and instruments in the C-Crosser, but this is no bad thing as everything is tried and tested. Only the Citroen purists are likely to moan as it won't feel 'right' in their eyes. One big plus is the, albeit optional, colour sat-nav system. Incorporating a touch screen, it's easy to navigate and boasts many useful features. The in-dash trip computer is also a useful addition to the C-Crosser's list of standard kit. The C-Crosser's big, supportive seats do a good job of keeping you in place. The car's cabin is well insulated from the outside world, although the diesel motor can prove vocal when pushed hard - itself something that rarely needs to be done. Plenty of cabin space means that you're never clashing limbs with fellow occupants. There's nothing out of the ordinary fitted to the C-Crosser to keep it safe, just the usual remote locking, immobiliser and alarm set-up. This all should do the trick anyway, and with the sat-nav unit being a pretty discreet-looking item, casual thieves are unlikely to be tempted. And to help combat attention from those types, a nice big, bright yellow steering lock should be a sufficient deterrent. All the usual features are present: airbags front and side plus anti lock brakes and electronic stability systems. As per the SUV tag, you also get switchable four-wheel drive, which comes into its own in slippery conditions. A front-drive mode is available, but leaving the car in the auto mode allows it to send power to the appropriate wheels when the going gets tough. With even a leaf-strewn wet road possessing the ability to catch you out, the C-Crosser's all-wheel drive is a useful addition. Despite its tall stance, the C-Crosser behaves surprisingly well on the road. Predictably, straight-line cruising is no bother for the big Citroen. The lone 2.2-litre diesel option is powerful yet refined at speed, and helps the car maintain a relaxed pace on the motorway. In town the C-Crosser copes well with sharp direction changes and poorly surfaced roads, while on cross-country routes the car can be hustled along with impressive ease. Alongside the compact people carrier, the compact SUV has been fully embraced by families. And with good reason: space, versatile and durable interiors, (almost) go anywhere abilities and a raised driving position have all helped to boost the sector's appeal. The C-Crosser combines all these elements into an affordable car boasting decent equipment levels and an impressive diesel engine option. If you need a compact SUV and it will be your first, the C-Crosser - and its clones - is easy to drive. Parking will require a bit of practice, while running costs will be a bit more than for a regular family hatchback. However the C-Crosser is largely vice-free, which will be good news for the novice driver. For many the concept of a Citroen SUV is probably an alien one. Yet in a bid to take even a small slice of the soft-roader market, Citroen's decision to rebadge a very un-Citroen vehicle is admirably pragmatic. 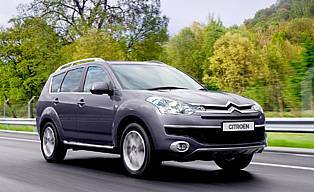 In value for money terms the C-Crosser is attractive, and the Citroen's new nose is way more successful than Peugeot's attempt with its 4007. 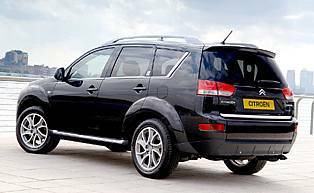 Build quality-wise the C-Crosser is just like Mitsubishi's Outlander: good and solid but not outstanding. For an SUV with a higher than normal ground clearance, the C-Crosser cabin is easy to get in and out of. All the doors open wide and the tailgate requires little effort to lift despite its considerable size. A nice touch is the tailgate's split lower lip, which opens separately so items can be slid in or our. The only negative element is the restricted access to the rearmost row of seats - ideally you need to be a small child or very agile. The standard issue kit will be good enough for most people, although there is a very flash colour sat-nav and media player available as a cost option. The aftermarket unit boasts a big, touch sensitive screen and excellent sound quality. Music can be stored on the player's hard drive if you don't want to play CDs. On the outside, the C-Crosser looks best in dark metallic colours. This premium image isn't quite followed through on the inside, though. 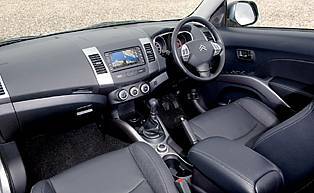 The largely Mitsubishi interior isn't up to Citroen's usual higher standards. It's all pleasingly dark and sombre, but it can't hide its Far East origins. Although a big vehicle by family car standards, the C-Crosser isn't difficult to drive. Even small car parks pose few problems thanks to the car's tight turning circle. The car's steering is pleasingly light at low speeds, and the optional reversing camera - the image is displayed on the sat-nav screen - helps make parking easier. Diesel engine options - 2.2-litre (156bhp). Transmission options: six-speed manual gearbox. Trim levels: VTR+ and Exclusive.